Okay, so it’s big news that the NBA suspended Amare Stoudemire and Boris Diaw for one game for leaving the bench after the San Antonio Spurs’ Robert Horry cheap-shotted Phoenix Suns guard Steve Nash into the scorer’s table. I see that my fellow blogger Jason has addressed the sporting aspects of this suspension. I’ve want to go off in a different direction. I had the chance to hear ESPN Radio’s Dan Patrick interview NBA Commissioner David Stern yesterday. And it was kind of strange in that they both shouted at each other, and there was evident anger. Anyone who listens to Patrick knows that the guy doesn’t ask the most difficult of questions (notice how they rarely let Keith Olbermann grill anyone – the one exception that I can think of was when NFL Hall-of-Famer Lynn Swann was a guest, and since Swann was running for governor of Pennsylvania, Olbermann got to ask questions, and we all got to listen to Olbermann make a fool of Swann). Stern claimed that the suspensions were automatic. That Stoudemire and Diaw left the bench during an altercation, and that the rules call for a one game suspension when this occurs. Patrick countered that since the Spurs caused the issue by the cheap shot foul on Nash, that shouldn’t the Spurs be the team punished, not the Suns. Stern responded, loudly, that his hands were tied. That that’s what the rules say. This went on for awhile. But then it got interesting – to me, at least. David Stern claimed that the primary reason for the bench suspension rule was to prevent another Rudy Tomjanovich situation. Which is strange, since this rule would have had no effect on the Tomjanovich situation. The impetus for the rule is to prevent brawls on the court. If there’s a hard foul, cheap shot, fight, etc., the players on the bench should stay on the bench. That way, the players on the court don’t have to fear someone on the bench coming up from behind and knocking them out. So, any player that leaves the bench area during an on-court altercation is automatically suspended. But this has nothing to do with Rudy Tomjanovich. For those who don’t remember Rudy T. as a player, he was Bill Bradley-type shooting forward known for his play outside the paint. In December of 1977, the Rockets were playing the Lakers in Los Angeles. Rockets center Kevin Kunnert and Lakers power forward Kermit Washington got into a little incident around mid-court. The Rockets had the ball. And Tomjanovich, who was in the game, had been on the Lakers end of the court, and with the ball going to the Rockets, trailed the play up the court. Seeing the fight erupt, and seeing Kareem Abdul-Jabbar pin Kunnert’s arms, Tomjanovich sprinted toward the action. As he neared, Washington turned and threw a punch that connected on Tomjanovich’s face. Tomjanovich collapsed to the court. He nearly died. So, yeah, it’s easy to see why David Stern wants to prevent another Tomjanovich incident. But this rule that he’s used to suspend Stoudemire and Diaw has nothing to do with a Tomjanovich situation. Every player involved in that incident, Rudy T., Kunnert, Washington, and Abdul-Jabbar were on the court, playing in the game. None of them came charging off of the bench to become involved. I guess that the whole point I’m trying to raise is that it was good to hear someone challenge David Stern – I don’t think he’s the genius that many think that he is. But if Patrick’s going to challenge him, then shouldn’t Patrick challenge him with the facts? Stern cited the Tomjanovich matter several times as being what this rule was trying to prevent. But this rule didn’t come into effect until the late-90s, nearly two decades after the Tomjanovich matter. So why didn’t Patrick call him on this? Why didn’t Patrick nail Stern for a loose interpretation of the facts? And if anyone in Houston wants to really know the impetus of this rule, maybe the media should find the undisclosed location housing Rockets coach Jeff Van Gundy – he is still the coach, isn’t he? Because if there’s anyone who knows the impetus of this rule, it’s Van Gundy. 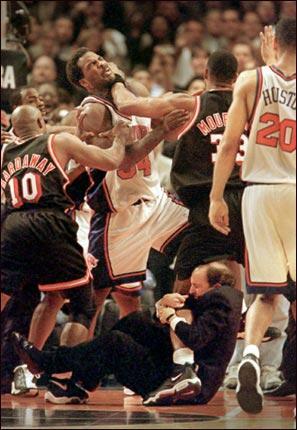 After all, who can forget then-Miami Heat center Alonzo Mourning shaking his leg, trying to dislodge then-New York Knicks head coach Jeff Van Gundy, who had a death grip on Mourning’s leg?